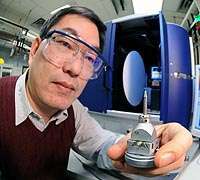 Materials engineer Duck Young Chung examines a sample of superconducting crystals before characterizing them in a X-ray diffractometer. The crystals signify the next generation of experiments utilizing neutron scattering to determine unconventional superconductivity. (PhysOrg.com) -- Scientists at U.S. Department of Energy's Argonne National Laboratory used inelastic neutron scattering to show that superconductivity in a new family of iron arsenide superconductors cannot be explained by conventional theories. But inelastic neutron scattering is sensitive. Osborn, along with Argonne physicist Stephan Rosenkranz, led an international collaboration to perform neutron experiments using samples of the new compounds made in Argonne's Materials Science Division, and discovered a magnetic excitation in the superconducting state that can only exist if the energy gap changes sign from one electron orbital to another. "Our results suggest that the mechanism that makes electrons pair together could be provided by antiferromagnetic fluctuations rather than lattice vibrations," Rosenkranz said. "It certainly gives direct evidence that the superconductivity is unconventional." Inelastic neutron scattering continues to be an important tool in identifying unconventional superconductivity, not only in the iron arsenides, but also in new families of superconductors that may be discovered in the future. A paper ("Unconventional superconductivity in Ba0.6K0.4Fe2As2 from inelastic neutron scattering") on Osborn's and Rosenkranz's work has been published in volume 456, pages 930-932, of Nature. Funding for this research was provided by the U.S. Department of Energy, Office of Science, Office of Basic Energy Sciences. That's all very nice, but what temperature does this effect occur at? Ba0.6K0.4Fe2As2 becomes a superconductor below 38K Is it cool, doesn't it? The question rather is, why such mechanism in arsenides still differs slightly from one in cuprates, whose superconductivity band exhibits s-wave symmetry, having zero orbital angular momentum. The copper ions contains most of free electrons in s-orbitals, while the iron ions are utilizing spin coupled d-orbitals of lower symmetry degree. The BSC theory isn't still out of game completelly - it just applies onto pairs of spin entangled electron clusters instead of individual particle pairs, i.e. Cooper pairs are condensing into boson superfluid due the internal pressure of atom lattice.